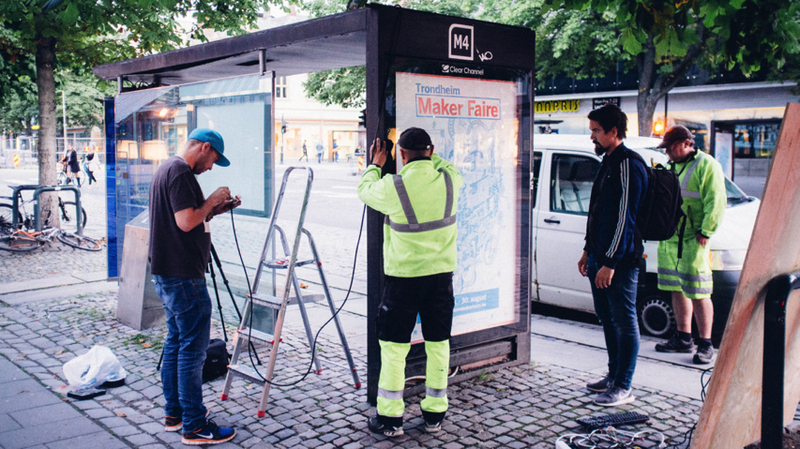 To promote this year’s Trondheim Maker Faire, HK reklamebyrå, Norwegian Creations and Trondheim Makers “hacked” two bus stops in the heart of the city. Rather than go with old-fashioned poster signage, the group of Makers wanted to do something a bit more special. With only one week of preparation and a very limited budget, we had to use what we had in our drawers. I’m not sure if the city of Trondheim, ATB (the bus company) or Clear Channel knew what they allowed us to do, but each of them said “yes” without any other reservations other than, of course, that we had to return the bus stops to a state normality upon completion. Aasmund doing some accurate measurements for Øyvind. 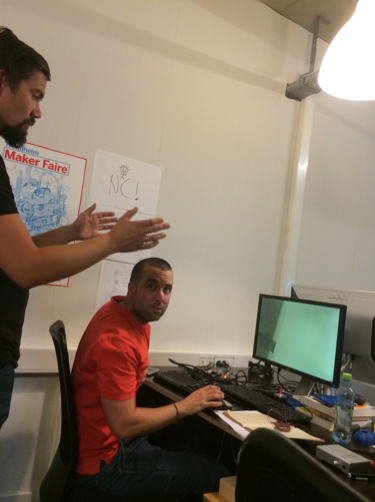 As with any Maker project, there were problems to overcome. The first challenge we experienced was how to get stable AC electricity. The outlets in the poster boxes are on the same system as the street light; as a result, there’s only electricity when it’s dark outside. This was certainly a bad thing if you want to have it up and running during daytime, or even evenings because of the long Norwegian summer days. So, we actually got the keys to the boxes that contain all the network and electricity for the real-time timetable system used by the bus company. 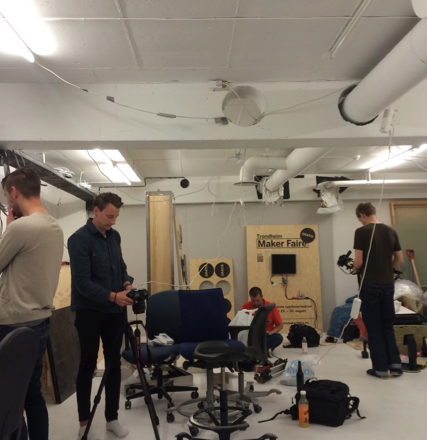 Preparing the plywood and electronics at the Fix Makerspace in Trondheim. The first bus stop we started working on was the one with a retro game. Our first plan was let people play Super Mario Bros, but we soon realized that it would be difficult for the player to control the game, as we wanted to use a MaKey MaKey and aluminum foil tape on the glass for game controls. We did not find a easy way to combine directional buttons with the A and B buttons, since one hand had to be in contact with ground all the time. Given the limited time, we elected to use another game, where you just needed one button a time: Pac Man. In short, the incredibly innovated Pac Man bus stop consisted of a pre-cut sheet of plywood with an old computer screen, a Raspberry Pi with the retro game installed, as well as a MaKey MaKey controlled by aluminum foil tape on the glass front of the poster box. We did not give the players the opportunity to leave the game. The other bus stop, we decided to transform into a photo booth using a Raspberry Pi, a PiCam and a MaKey MaKey, which we didn’t have. 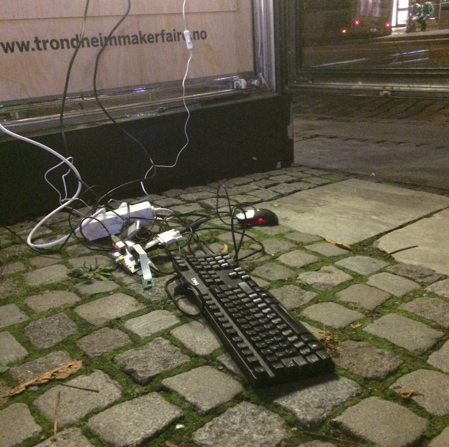 Without any place to get a MaKey Makey in Trondheim, and an inadequate amount of time to order online, we turned an Atmel Xplained Mini into a MaKey MaKey-ish controller. The Xplained Mini that saved the day! Our first plan was to upload all the pictures from the bus stop photo booth directly onto our webpage; however, since the bus stop was located downtown and was open to the public, we needed some kind of moderation. The pictures were sent from the Raspberry Pi to an email address. 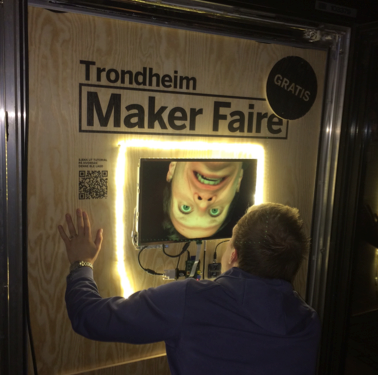 All the codes for the photo booth bus stop could be downloaded from Maker Faire Trondheim’s website. All in all, this was a fun thing to do — both for us who were working with the project and for all those who played Pac Man and took selfies at the bus stop. As we imagined, there were even some commuters who chose to continue playing instead of hopping aboard the bus! 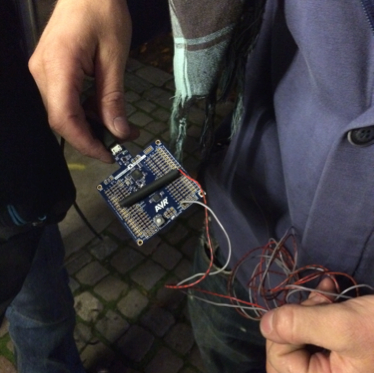 This entry was posted in Maker Movement and tagged Atmel Xplained Mini, Maker Faire, Maker Faire Trondheim, Maker Movement, Makey Makey, Pac Man Bus Stop, Selfie Bus Stop, Trondheim Makers on September 15, 2014 by frodehalvorsen.